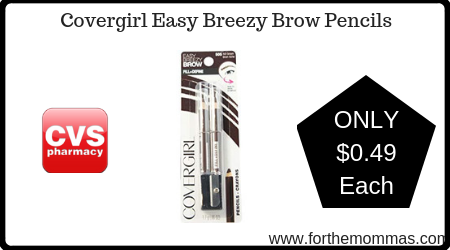 Starting 2/17, CVS has a great deal on Covergirl Easy Breezy Brow Pencils. CVS has it for only $4.99 each plus you can add $2/1 Covergirl eye product coupon insert to bring the price down to $5.98. There is also an Extra Care Bucks offer you can submit that will make your final price only $0.49 each. Please note: there is a mystery coupon that will be printing at the coupon center starting 2/17 for all cardholders that could potentially make this deal free or moneymaker!